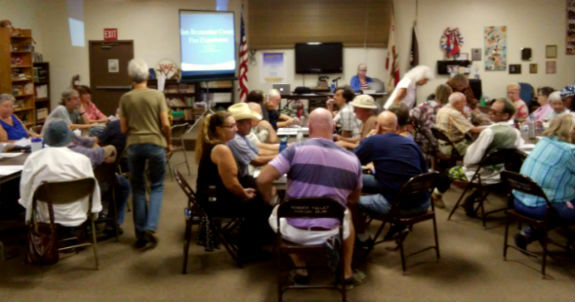 About 80 folks from Wonder Valley crowded into the Wonder Valley Community Center to hear San Bernardino County Fire Department Division Chief, John Chamberlin, Division 5, South Desert, discuss a proposed increase in the local fire tax. You're right, that's not 80 people. There were more people standing behind the photographer. DVDs of the meeting will also be available to check out in the Community Center. Links to the materials that Mr. Chamberlin passed out will also be posted here. Thank you to everyone who turned out for this important meeting.